So well-married and mature as to have reached perfection; Highland Park 30 is sublime. Overall – This is a serene dram. Creamy, dreamy – so devoid of disturbance it is like peering into the depths of a swirling, many-colored marble, buffed smoother than glass. Color – Dark reddish brown, held in the light it turns to cherry, as transparent as gemstones. Nose – Brandy preserved fruit, and pungent sherry, giving way to heather, oak and butterscotch creme brulee, hints of milk chocolate and ancient peat. Splash – Ridiculously devoid of heat, it is smooth as a palace floor. Palate – Medium to full body, expansive and deep, with oak, citrus zest, sherry and a touch of salted green peat, all so well-married that “balanced” no longer holds any meaning. Finish – mellow and effortless, with dry wine oak and floating chocolate toffee. The precious cargo arrived direct from Scotland, and sat mummified in bubble wrap for over week before we could afford the attention it deserved. And that was one long week, let me tell ya! The bottle differs from other expressions, as the “Highland Park” is actually embossed in the glass itself, the label reduced to a small strip declaring its advanced age. The Color – The darkest Highland Park we’ve seen in ages. Deep mahogany with a cherry stain. In the light, the reds come out like an aged Burgundy. The Nose – Immediately, orange peel and cherries that were preserved in brandy for years escape from the glass. Behind them, old fashioned brown sugar, so moist it sticks in clumps. On the deep, forceful inhale, a touch of the sea follows on the tail of the mature fruit compote – a faint tang of seaweed with its iodine perhaps, but it is soaked down inside wet wood. There is a thin trace of heat, or is it simply pepper? The gingered spiciness found in younger expressions is still there, but diffused and embedded in malt and vanilla, like a gingersnap cookie. This is an armagnac nose more than a typical whisky nose – cohesive, with fruit devoid of syrup. In the center is a solid beam of dry sherry, Oloroso perhaps but without the plump, juicy fruit found in some whiskies. And yes, a trace of sulfur from seriously old sherry casks. This is not the burnt match or feinty rotten eggs kind of sulfur, this is the actual element. This is brimstone. But as with every possible wolf note, be it wood or fruit, spice or malt, it is softened, pulled back, smoothed out until it assimilates with the whole. This is a graceful whisky, polished until no peak, pit, or rough patch remains across its surface or in its depths. And that holds true in the mouth as well as the nose. The Splash – No heat across the tongue whatsoever. I brace myself for the wallop, but it never comes. There is a fleeting dash of spice at the mid-tongue and that is all. At first it seems almost a letdown after such a deep nose. The wash of flavor is mellow and elusive and yet, in time, it proves itself quite expansive in all directions, but in the most understated of ways, as there is no kick, or spouts of intensity. It doesn‘t open up into a burn, it just opens up. And it makes the inside of the mouth feel wide and spacious. The Palate – Dried figs are revealed. An oak bowl with fresh apricots in their skin, or is that dried peach? Nothing of pear or apple surfaces. There aren’t any noticeable plums, or prunes typical of European oak soaked in Oloroso. The reserved malty core is awash with rolling spice, but there are no scratchy cloves, or biting cinnamon. It has all been reduced to an elixir from sources that exchanged so many congeners their flavor gene pool is homogenized, and in the best of ways. The Immediate Finish – The aftertaste recedes quickly into the finish, leaving genial, old oak in the center of the tongue, and across the top and back of the mouth the radiating glow of pale sherry and nutty, toasted malt. Effortless yet mouth-filling, the medium body is softened compared to younger Highland Park. There is zero bitterness, nothing swells up to out-perform the other flavors, or throw it out of balance. In fact, “balance” loses all meaning with an infusion such as this. A New Pour – After a rest, a bit more in the glass. Butterscotch, true butterscotch blooms from the second nose. Some vanilla notes arise, but as saltwater taffy. And that classic Highland Park floral element is suddenly apparent. In the mouth, the vanilla is creamy, not abrupt as with American oak, and there are no tropicals. This seems like all-European oak to me. French wine oak or Spanish sherry oak. But it is, probably, refill sherry casks, as it doesn’t have any of that heavy pipe tobacco in the pouch effect that can saturate malt whisky during such lengthy aging in first-fill sherry casks. I cannot say I remember what heather actually smells like, that wild flower with such a large, green nest of leaf below the petals. But I imagine this is what it smells like – blossom and leaf, fresh and faint with honey. It went undetected until I let the glass sit a while. But now it is gently floating on a tide of brandy-soaked sponge cake. Again I find the nose more like armagnac or cognac than “scotch”. The citrus remains but the candied oranges give way to lime zest found in younger Highland Park. What spice is there has been assuaged, what peat remains after all these years in the cask has been abandoned by the phenols and is all about the earth and dark, moist vegetation, but in only the faintest accent sort of way, like garden air after it rains. What was smelled is tasted. The report of the splash is consistent with the body that develops and merges into the aftertaste, which itself provides a glowing reflection of the overall palate. The weave of the finished tapestry holds together everything that was in the first nosing. Not that various facets aren’t revealed over time, but there are no big surprises in the taste that was missing from the nose. Nothing clashes. All has been polished until the facets have no edges and meld one into the other. It’s hard to believe it is 48.1%, as one keeps asking, where is the alcohol? Where is the burn? With Water – Any ghost of ester heat is removed entirely. Out comes the sweetmeat, the caramel, the burnt sugar under the chef’s torch. The lime now shifts over to lemon. And viola! Crème brule with some lemon zest. That is what was hinted at all along. This is a serene dram. Creamy, dreamy – so devoid of disturbance it is like peering into the depths of a swirling, many-colored marble, buffed smoother than glass. The late nose brings out some milk chocolate that has sat in its wrapper a good while, and some spiced fruit, or fruitcake. Orange marmalade notes tease the tongue, with the oak nicely integrated. The young sawdust tannins were gone years ago. The later tannins, which can make old scotch bitter like tea that brewed too long, have mellowed nicely and are less noticeable than a seasoning, yet they help to take away any syrupy sweetness that might have come from the sherry. The water separates some oils, but more like essential oils from wood and spice, which glimmer in the finish. They are nothing like you get from notably oily whiskies that coat the mouth with petroleum. Yet, a slight waxy effect appears on the inside of the lips and across the teeth over time, another hallmark of traditional Highland Park expressions. The dry glass wafts of caramel laced with black pepper and more raw ginger. Finally, some smoke or the memory of smoke appears, but barely a wisp to haunt the long, tranquil finish. The Conclusion – Recently, five Highland Park distillery expressions were sampled at a private tasting, with the 21 year old being clearly the most mature, complex and sophisticated of the lot (47.5% 2012). Tonight, after tasting the 30 year old, we sampled three core expressions, including the 21 year old. Then we returned to the 30 year old. Well, it made the 21 seem volatile, impetuous and undeveloped by comparison. In some ways the 21 is livelier. It has greater definition and its various elements of smoke, fruit and oak retain their identity. Classic Highland Park perfected. Much of it remains in the 30 year old; it has all just mellowed with age. And the depth has increased as well. Where the 21 takes you down to the last dirt floor of the last basement, the 30 opens the ancient, wooden trap door found there and lets you enter where few are ever privileged to go. Most every example of Highland Park is well-balanced. The 21 is actually wonderfully complex, yet with a deep, integrated balance only a mature whisky can achieve. But with the 30, there is nothing to balance. It has all become one. It was only when returning to the 21 year old that this really hit home. Only after sampling other excellent examples from the core range did the refined artistry and radiant elegance of the 30 year old Highland Park make itself so obvious. This is on a completely other plane of existence from mortal malt of the common man. Here is where the normal realm of whisky chemistry breaks down and is replaced by that which exists only under exotic circumstances. 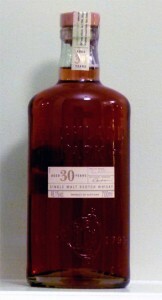 Highland Park 30 year old single malt scotch. Visit Highland Park, from the Orkney Islands, the Edrington Group’s only island whisky. Realllllly want that hard to find bottle of malt? Try the whisky exchange. Thanks, Gary. Your comment inspired me to go back to the review and I did some slight editing, having had the 30 HP again since I wrote it. And to prepare it for our new format which featured our exclusive Flavor Maps. I do not have the broader experience with mature scotch as many with deeper pockets, but I am seeing 25 years of age as typically where the older, bitter tannins start to assert themselves and the wood itself, as much as any bourbon or sherry, is providing grip and defining edges. Some whisky reaches that earlier and some later, of course, but it also seems that it is a phase that whisky passes through and then that woody edge softens. However, while woody, the HP 25 never has the kind of tannic bitterness or hard edges that I find in some older scotch, like many from Islay. And just as some whisky will “collapse” in a bad way as it reaches old age, the HP 30 has broken down the defining framework of all those flavors, but on the whole it has a sound three-dimensional structure, just full of that marvelous singularity from its heart. I would love to try the 40 to see what happens with the additional ten years! I would also say, for those who seek out that somber woody maturity and bitter edge that only comes with serious age, they may prefer something like 25 yo Glenfarclas or the 25 yo Talisker , which I just reviewed and published today to commemorate the victims of Hurricane Sandy. As that particular bottle survived the devastation and was gifted to me for having stored some valuables for someone while they renovated their home, no one knowing at the time everything else they owned would be washed away one year ago today. Thanks for the tip on Amrut Fusion. I enjoyed that myself, when I tried it at WhiskyLive! in April, but I only had a wee taste. It is my hope to include some international whisky in our reviews as time goes by. It is a hard sell for the 8 Men of Malt, since we have so little opportunity to meet, with so many busy schedules to accommodate, and so many worthy drams. But your endorsement is encouraging. And your comments, always welcome.